Why doesn’t women’s work figure in literature? We went to the Design Museum, mainly to see my daughter who works there, but also to look at the exhibition on Women, Fashion & Power. 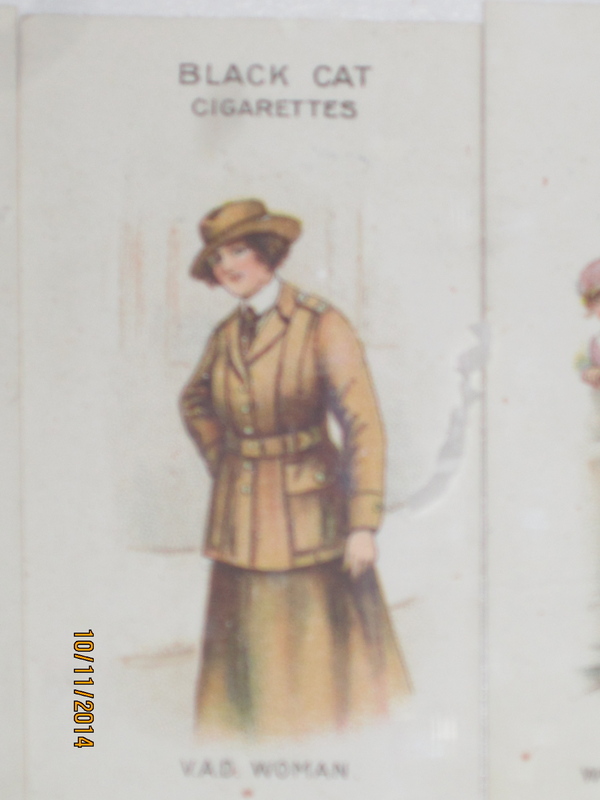 This cigarette card caught my eye because of the title at the bottom (rather blurred, I’m afraid): “VAD woman’. How fashionable you think her uniform is, and what it says about her power, is not the question here. I came across Voluntary Aid Detachments when I read Dorothy Whipple’s novel High Wages. It’s one of the very few books I’ve come across which deals more than just fleetingly with women’s paid work. High Wages was first published in 1930, and has now been smartly reprinted by Persephone Books. The heroine, Jane Carter, is a single woman, intelligent but poorly educated and ill equipped with marketable skills. She has no family to support her, and is grateful to get a job in a draper’s store, owned by Mr Chadwick. She and her fellow shopworker Maggie are paid a pittance, cheated by Mr Chadwick of commissions they earn on sales and by his wife of the food which forms part of their employment ‘package’. They work about 12 hours a day, six days a week. It is 80 years ago so, although Jane lacks qualifications, she doesn’t lack competence. She is also enterprising. She hears that Northgate, a great house on the fringe of the town, is to be turned into a Voluntary Aid Detachment (VAD) hospital, and suggests to Mr Chadwick that he must tender to supply the hospital with bed-linen, table-linen, towels and so on. Jane takes it on herself to go to Manchester, returns with a specimen VAD uniform, dresses a wax model in it, and announces outside the shop that such uniforms are supplied within. She gets to know about a YMCA hut to be opened near Northgate, and procures the blue overalls and veils for the voluntary helpers. What is the result of her enterprise and skill? Exploitation – the gap between competence, effort and reward – has always existed. Today Jane would certainly not lack qualifications and she would be far better paid, and better protected (though some of these gains are today far from secure). But the reward for her competence would still probably fall some way short of fairness, if not as far as it did in Whipple’s novel. I said at the top that this is one of the very few examples I’ve been able to find of fictional accounts of women’s employment. I was really surprised when I set out to gather a few examples which would illustrate the PP arguments: women working in jobs which didn’t match their skills, or careers which didn’t go far . I phoned a few friends, much better read than I am, and they came back with George Eliot, of course, and quite a few others from Victorian times. But there were hardly any items from contemporary or near-contemporary fiction. I went to the British Library and consulted a few encyclopaedias, first of women writers, and then of fiction more generally – about 10 volumes in all. It was hardly what you’d call rigorous research, but here are the results. In none of the indexes did ‘ work’, ’employment’, ‘job’ or ‘economic’ figure at all. The nearest I could get were 5 entries in Paul and June Schluter’s Encyclopedia of British Women Writers, under ‘Women and Feminism: equality in the workplace’. Of these two were from the C19 -Anne Brownell Johnson and Charlotte Turner Smith – and the other three from the first part of C20: Olive Schreiner, Mary St Clair Sinclair and Beatrice Webb, and BW’s work was, predictably, a tract on ‘The Wages of Men and Women: Should they be Equal? (1919), so not fiction. I half-expect to be emphatically proved wrong – tell me so; there must surely be more accounts of how women get on or not at work. I’m curious. Silver lining: is now the opportunity to change the standing of part-time work?